For those of you who want to go where no one else goes. 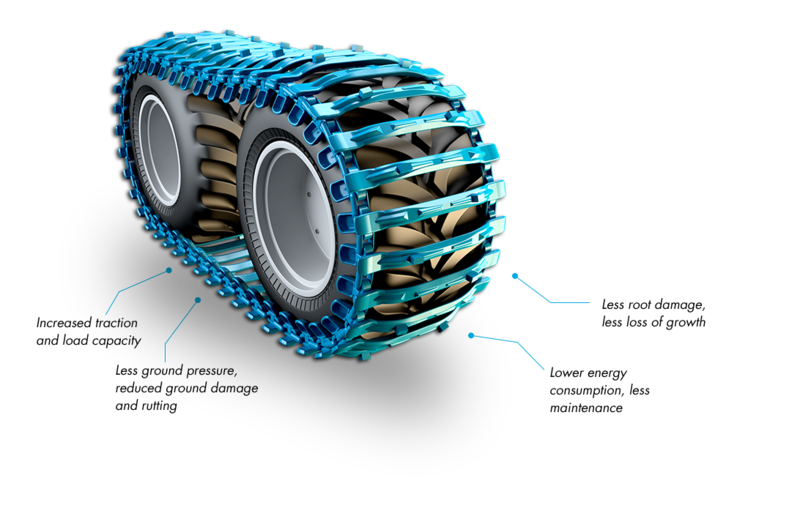 The ECO-TRACK design, with a high linkage system, significantly reduces rolling resistance compared with conventional tracks. The new generation of extended cross members produces even less ground pressure and damage and increases your carrying capacity. The wide assortment of track models provides several different sizes and models suited to many different machines and ground conditions. Superior quality and performance results in fewer breakdowns and increased productivity. ECO-TRACKS, the name you can trust! Our country can be tough. This has taught us to make tracks that carry your harvester forward, regardless of the terrain. Over, regardless of obstacles. Upwards, regardless of grade. Regardless of the machine you have, the job you need to do and how rough the terrain is, we have a track for you. With tracks from ECO-TRACKS you can load more and gain better traction while at the same time, cause lower impact in forests and open land. The secret behind the benefits is in the design. Our tracks have a highly placed linkage system and a new generation of cross member with extended and turned-up ends. We know that the territory where you work puts high demands on performance. is why our tracks are developed both with you and the environment in mind. and ensure that regrowth of the forest remains strong. Here are five reasons for choosing ECO-TRACKS. Welcome to our territory. With ECO-TRACKS, your tyres will attain more than twice the usual service life. This is due to the track having contact with the ground and wearing instead of your tyres. Without tracks, your tyres last for 3,500–4,000 hours of operation, hours during which you also risk punctures and other wear damage that keeps you from working. With our tracks, you avoid this type of damage and after 7-8,000 hours of operation, 75 percent of your tyres’ service life still remains. Thanks to a larger contact surface, your machine will be steadier and you can load more. Your machine will be better balanced and run with greater stability over the terrain. This stability reduces the risk of your machine overturning. You can drive faster and load more without worrying about tipping. This saves time and provides an improved operating experience. With tracks, the machine will have a larger contact surface and the centre of gravity is distributed over a greater area. Regardless of the surface you operate on, ECO-TRACKS give you better grip and pulling power. This is mainly due to two things. First of all, the larger contact surface than with tyres alone; and secondly, the unique shape of the cross members on each track. The size and profile of the cross members differ, entailing that each track is optimised for a certain type of terrain. ECO-TRACKS are gentle to the forest and ground where you work. With our tracks you secure regrowth of the forest and ensure that it will continue to be profitable well into the future. 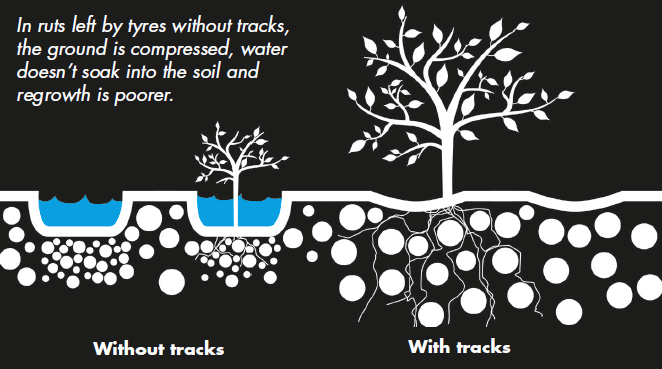 Without tracks, your tyres dig in and leave deep ruts in the ground and damage tree roots. The ground is compressed and water collects in the ruts that cannot soak into the soil. This ultimately leads to poor regrowth and quality, and the forest’s profitability declines as the years go by – or in the worst case, disappears. With ECO-TRACKS, your fuel consumption decreases thanks to the tyres not digging down as deep into the soil. The machine doesn’t have to work as hard and consequently consumes less fuel. The reason the tyres don’t dig down as deep is that the pressure the machine applies to the ground is more evenly distributed. With tracks, the pressure is more evenly distributed against the ground and the tyres don’t dig down as deep.